A couple of weeks ago I delivered a Master Class Workshop for Not for Profit Organisations as part of the Leadership Victoria Director Dynamics Master Class Series : How do successful boards manage the“unknown unknowns? As part of that process I re-examined my own thinking on what board’s should be doing generally in this area and decided I should write down my process of thinking through the issues in a format that allows more examination of the issues than the confines of the workshop. In the article Cossin and Metayer have the view that the role of the board varies depending on the context they find the organisation in and that when those contexts change then the board needs to change its role. My view is that boards are generally operating in an environment that is simple, complicated, or complex and occasionally dipping into chaotic environments, which most people would define as crises. If we look at the graphic from that point of view then boards that are operating towards the right hand side require both a different approach but also more time to commit to the organisation. As the context moves to the right the requirements for a supervisory role do not diminish but the requirements in the rest of the roles increases. More and more boards are operating in complex environments due to the increasing complex, networked and connected world we live in. This presents a problem in its own right. In my experience a lot of boards and the management have not even thought through the context they operate in this deeply and are not really operating in the optimal way in a relatively stable environment (in this case stable does not mean the opposite of complex or chaotic but that the organisation is operating in one context or another). Thinking through this more deeply is highly valuable for the board because until they have decided what environment they are largely operating in then the role that boards tend to take are dependent on historic operating modes of the organisation, or tried and true ways that directors have operated previously.The problem with this approach is that confronting new problems with old approaches only works if the problem is similar to the old problems. In my early days as a board director I was enormously impressed by a Chairman who seemed to be a great thinker and strategist. Over time I realised that it was the product of a long experience and applying previous approaches to problems. As the organisation encountered more and more complex environments his ability to strategise fell away dramatically as novel problems and issues presented themselves. However I am not saying that we all need to start operating in a mode that suits complex environments. This works in both directions. 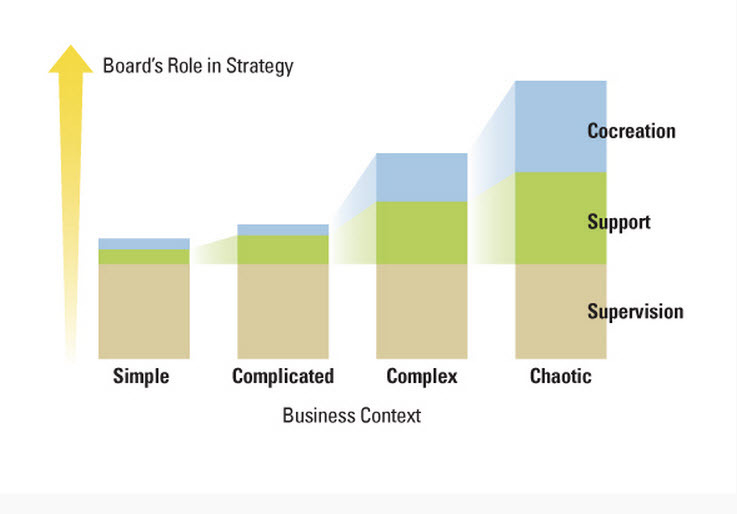 Boards should not apply complex context modes of operating to simple operating environments. There is as much danger in doing that as applying simple modes of operating to complex environments. 1/ While strategy should be about the exploitation of risk defined by an appropriate understanding of the risk appetite of the organisation many not for profit board members are more concerned with managing their own risks rather than the risks of the organisation. This results in a risk aversion mindset due to their requirement for there not be be “problems on their watch” which means avoiding failure at all cost. Which translates into “avoid highly visual failure at all costs” . However failing by not taking appropriate risks is not as visible and therefore risk is minimised at all costs which includes either constricting the capacity of the organisation or creating crippling compliance requirements. I have witnessed a board that deferred to the lawyer on the board when talking about risk because they felt that he had the appropriate expertise without realising that he was all about building his board resume and looking for other board positions and so was highly risk averse for the wrong reasons. In the context of the framework that Cossin and Metayer have provided this often results in a board being overly supervisory and spending too much time in that role to the cost of their other roles. 2/ Not for profit boards generally have less time to commit to the organisation. This varies tremendously for individual board member, some of which spend an enormous amount of time and effort on the organisation. However the time for collective strategy efforts tends to be constrained by the length of board meetings and how much time the more time pressed directors can spend on the organisation. In the context of the framework presented this means two things. Firstly with limited time boards tend to feel that they have to get the supervisory role right and therefore co-creation tends to take second place. I have worked with several boards where it is the first time they have spent more than an hour on foresight and thinking deeply on their strategy (as opposed to reviewing a strategic plan presented by the management). Secondly in environments that are more complex the time commitments are higher and this makes it more and more difficult for the board to feel that it is carrying out its role well. This can sometimes work well in a chaotic environment where it is all hands on deck in a heroic stance. However it is far more difficult when operating in a complex environment in an ongoing manner. 1/ Simple environments are defined by simple cause and effect relationships which can be readily understood where best practice is the main approach. 2/ Complicated environments are defined as where cause and effect are still understandable but they are more complicated. This is the area of systems thinking and expertise. There may be feed back loops and time delays and multiple interactions but with sufficient expertise and analysis they are understandable. In my next section of this series of posts I will explore what a board can do to operate in increasingly complex environments and then move on to ways of thinking about foresight and strategy.